On Monday morning we woke up late, Paul and Chris had caught an early flight so it was now just Kath and I. It was another cold day -11c with a breeze that felt like ice. We took the train to Museum Island, stopping for a coffee and breakfast on the way. The cafe we found under the arches was amazing, bohemian with excellent food and coffee, it was better than any chain store I have ever visited. There are several museums all together on Museum island. We decided on the Pergamon museum, as recommended by my friend Hanna. The Pergamon is a large Museum, and features the reconstruction of parts of Pergamon an ancient Greek settlement. Its very impressive. They also has a 360degree panorama view of an artists impression of the city as it would have looked in the Greek era. It was very well done, changing from day to night using florescent paint to give the impressions of movement. After the Pergamon Kath noticed that there was a Salvador Dali museum, so we decided to give that a try.Dali was such a character, instantly recognisable. I never realised how many films and TV adverts he was involved in. For example designing this scene from Hitchcocks film Spellbound. He also did lots of illustration work, I knew about Don Quixote but not Faust nor Alice in Wonderland. After the Dali museum we met up with my friend Hanna and her husband Silvio. I haven't seen her for years since she was working at Bristol. 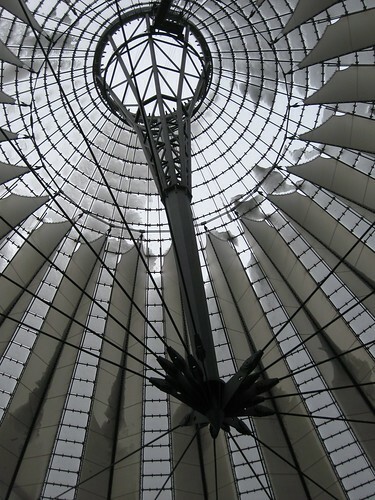 They took us on a little walking tour first to the Potsdamer Platz. During the communist era this was divided by the wall. I mused what had happened to the underground. Apparently they was also bricked up by the communists. Next stop was the nearby Sony Centre. Built as a retail store with a roof to ape mount Fugi its an impressive shopping centre. Kath and I went for brunch there the following day. Hannah and Sylvio then took us to the Brandenburg gate. It was nice to see at night and hear some more trivia from natives. Heading from there to the holocaust memorial. What I hadn't realised is that was Hitler's bunker. We were unable to go down as it was closed. On returning from Belirn I read about the underground Berlin tour, which take in Bunkers, and various underground complexes I hope to take this next time I visit Berlin. After the walk we were feeling pretty cold, we asked them to take us for German food. They recommended a Bavarian restaurant. We shared a plate of meats, it was very enjoyable. The next day Kath and I both felt very tired. Eventually heading out for a walk ending up back at the Sony Centre where we stopped for an enjoyable Brunch. In the evening we met up with Hanna and Sylvio again. Taking a quick walk and to Alexander Platz home of the the world clock. Then went for a Curry. Unfortunately Kath was feeling a bit feverish so we basically eat dinner and left. It was nice evening thought Hanna seemed more relaxed having gotten her exam out of the way. Wednesday was the final day for Kath and I in Berlin, Her train left at 10.15. I went to the station with her, and hugged her goodbye. Then I went to meet Sylvio, Hanna had to work. After taking a short walk to see the O2 Arena Berlin and some bits of the wall, Sylvio and I had a look round the Berlin video games museum. Although small it was a voyage of nostalgia for me. We had a kebab for lunch then he was kind enough to accompany me to the airport. I think he got a good laugh when I got stopped by the security guard. I am not sure what but something on me triggered the metal detector. I really enjoyed Berlin, there was a lot to see so I hope to be able to return there and take in all the places I missed out on. It was especially nice to meet up with Hanna again, and meet Sylvio, Kath and I were both grateful to them for their hospitality.